By the 1880s, about 200 industrial factories were in Columbus. These industries included factories manufacturing shoes, cigars, farm tools and machinery, furniture, carriages, and brooms; iron manufacturers and foundries. One of the larger companies began as the Iron Buggy Company created by Clinton Firestone and George & Oscar Peters. This company (shown above and in the advertisement below) advertised it could produce one buggy every 8 minutes. 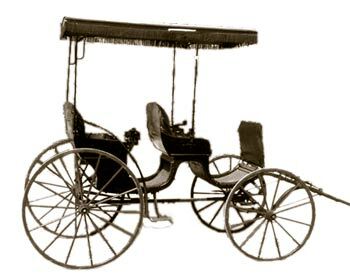 In 1875 the founders sold the Iron Buggy Company and formed a new company: the Columbus Buggy Company. 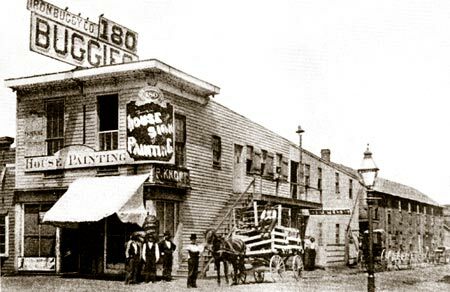 This new buggy company had a plant located at Wall and Lucas Streets (about a block west of High Street and a block south of what is now Nationwide Boulevard). By 1900, the Columbus Buggy Company employed over 1000 people. Clinton Dewitt Firestone was the company's president. Both Harvey S. Firestone and Eddy Rickenbacker got their early business experience while working at the Columbus Buggy Company, before moving on to other ventures. With the advent of the automobile, buggy and carriage manufacturers faced serious competition. Like some other companies, the Columbus Buggy Company's management decided to begin producing automobiles in the early 20th Century. The company built several different lines, using both electric and gas power. Unfortunately, these changes were not enough for the company to survive. The Columbus Buggy Company went bankrupt in 1913. Original Columbus Buggy factory located at the corner of High Street and Hickory alley (just north of Spring Street). The Columbus Buggy Company was a thriving business by the late 1800s. The company expanded to a new factory at 400 Dublin Avenue after the turn of the century (Dublin Avenue is now Nationwide Boulevard, and the plant would have been located just west of the Nationwide Arena district, across the rail road tracks). Ohio had many buggy manufacturing companies at the beginning of the 20th Century, but the Columbus Buggy Company, was the largest, with plants not only in Ohio, but in different locations throughout the country. With the invention of the automobile, these buggy manufacturers saw the future of horse-drawn transportation was at an end. 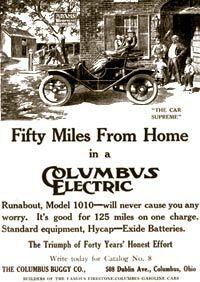 Many of the companies started manufacturing powered buggies, with the Columbus Buggy Company leading the way with both electric and gasoline powered models. However, when Henry Ford developed the innovative assembly line manufacturing plant, the large buggy companies could not compete with them, nor did they have the financial strength to convert their already existing large plants into assembly line production facilities. The other major factor in the demise of he Columbus Buggy Company, like many other manufacturers in the state, was that the new horseless carriages were being made out of steel. Columbus had iron mills, but steel was a new industry that required lots of raw materials not easily transported long distances by rail. Thus the auto manufacters gathered in the port cities like Detroit and Cleveland where these raw materials could be brought in by ship. Thus ended the age of buggy and automobile manufacturing in Columbus. The Firestone Mansion at 1266 East Broad Street, named on behalf of the original residents, Joseph F. and Josephine Firestone, was listed in the National Register of Historic Places in 1987 as a contributing building in the East Broad Street Historic District. This district nomination is part of a larger collective nomination called the East Broad Street Multiple Resource Area, which includes not only this linear district, but also several individual and clustered buildings along the East Broad Street corridor between Parsons Avenue and Nelson Road. The Firestone Mansion was the home of Joseph F. Firestone, a vice president and manager of the Columbus Buggy Company at the time the house was built. Efforts to save the Firestone Mansion from demolition recently failed and the Columbus Foundation tore down the Firestone Mansion to make room for expansion to their expansion plans. Many felt that the Columbus Foundation set a bad precedent. The Foundation acquired the property in 1999. The 9,859 sq. ft. building had an estimated current value of $388,700 and would have required about $2.5 million to restore the mansion. Eddie Rickenbacker began his automotive career in the Evans Garage. To upgrade his mechanical skills, he took a mechanical engineering course from International Correspondence School in 1905. He successfully campaigned that same year to land a job with the Oscar Lear Automobile Company in Columbus, working for Lee Frayer. Eddie worked for the Oscar Lear Automobile Company until 1907 when he followed Lee Frayer to the Columbus Buggy Company. The photograph shows Eddie in a Firestone-Columbus, driving orator, statesman, and politician William Jennings Bryan (seated behind Eddie) on a Texas speaking tour in 1909. Eddie was in Texas helping the Columbus Buggy Company establish dealerships for the Firestone-Columbus and offered to drive Bryan as an advertising stunt.